There are only a few boxes, a few outlines of shapes, out at the Man Base just now. Plywood sheets are being carried to and fro, two by fours are being cut to length, and the big Man’s legs are lying comfortably horizontal on the ground. We know, of course, that there will be a Man this year. Another big Man of giant proportions. Apparently gone are the days when the Man was the same size every year, built by the same Man Krewe. But what kind of maze will it be? And what metaphors will you draw as you perhaps loop around and around the same section of the puzzle, looking for a way forward, but repeating the same mistakes? Burning Man is an organization, a large and growing one, so when it faces a problem, it does what many other large organizations do: it calls for meetings. Many meetings. And it was at one of these meetings that the path of the organization and the path of an individual collided, in one of those meaningful coincidences for which Burning Man has earned its reputation for synchronicity. “I know how to design mazes,” Kristin Thomas said softly, maybe a bit awkwardly, at that fateful meeting about the maze. And so it was that a woman who was on her first day on the job as production assistant filled a need completely separate from the job for which she had been hired. And you can trace the path that brought her to that room, with Larry Harvey and other major organizational personages, because of a crush that she had on a boy back when they were in fourth grade. And maybe also because she had found a path to the person that she wanted to be, rather than the person other people thought she should be. Kristin Thomas grew up in Michigan suburbs, where people went to church every week (she eventually stopped going, and was considered a heathen because of it). In high school, she was both a nerd and extremely self conscious about being a nerd. She didn’t fit in. “I was an awkward, awkward teen,” she said yesterday as she sat in the shade of a plywood sheet out in the middle of the desert. Kristin left her comfortable but confining life in Michigan and went to college at the University of Colorado in Boulder. And she realized along the way that she could re-invent herself, “shed the layers of not me,” as she put it. A few years ago, Larry Harvey his own self was doing his yearly meeting with members of the media who were attending the Burning Man event. Now, we hesitate to cast aspersions on the group, because we used to be one of them, but honestly, some of the questions they posed were, to be kind, lame. It was clear they hadn’t been paying attention. They needed someone to explain Burning Man in a nice neat little package. But this wasn’t the time or place. The event was roaring all around them. The answers were out there, not in here in with the cameras and the notebooks. But Harvey turned their questions into an opportunity to talk about some of the things that he had been thinking about recently. 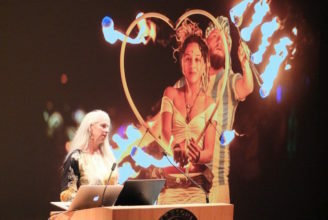 He had turned 60, and he said he had become less self-conscious, less concerned about what people thought of him, and more concerned about how Burning Man would go forward. In other words, he cared less about what people thought of him now, and maybe he had become more concerned about what they’d think of him in the future. Kristin was fortunate enough to have made a similar realization as she moved through college into adulthood. She stopped trying to be the person other people wanted her to be, and she cared less that she wasn’t fulfilling other people’s expectations. “You know how they say that you should pay attention to the things you are doing when you are procrastinating,?” she asked. She started doing that. She came to her first Burning Man fourteen years ago. Suddenly she was surrounded by people who were wearing the kinds of things that she loved, that she thought it was only she who thought they were cool and interesting and expressive. And now she was in a place where everyone was wearing them. And in that moment she found a calling. Eventually she started her Mythica Clothing company, and she took a part-time job with Burning Man to help put together the money to bring her dreams to life. But what about the meeting and the maze? How did it happen that she had just the right answer to a question that she didn’t know was coming? “Oh, I had a crush on a boy in the fourth grade,” she laughed. “And he liked mazes. So I liked mazes, too. I bought books and began studying them.” Ever since then, she’d drawn maze-like doodles, and so when Burning Man needed a design for a maze, she drew one that everyone loved. No further meetings were needed. And you’ll be making your way through one of her mazes, one that’s been polished and refined and made sufficiently challenging, when you make your journey of discovery at the base of the Man this year. Just try not to keep making the same mistakes. And try not to listen to people telling you where they think you should go. You’ll never get anywhere. In other news, Makeout Queen hosted her fabulous Manhattans party at the Black Rock Saloon last night. People turned out in all kinds of finery – skin-tight dresses, sparkly jewelry, feathery boas. And you should have seen what the women were wearing! Ok, not all the guys were dressed as women: There were a good number of formal shirts, tuxedo jackets and spats. Overall, though, it was a magnificent-looking crew. Even after a back-breaking day in the very hot sun, this group cleans up well. Cool story…I can’t wait to find myself in that maze (or not). The photos create an ache in my heart to get out there and help build BRC…some day…it’s going to happen. Love the story and can see my own journey reflected a lot in hers. I’ll always be a geek though, and embrace and love it for what I am! I also have used the term peeling off the layers to myself, cool that someone else does too! funny, I can’t think of a single question to ask Larry. I can only imagine what some members of my Christian church would say about this….